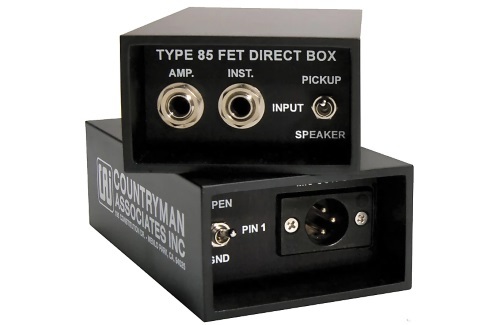 Going deeper with the passive versus active DI (direct input box) conundrum, summing, and the use of tube and FET models. Ah yes, the old DI (direct input box) conundrum. Here’s the skinny: All DIs fall into two categories: active and passive. Passive DIs provide complete signal isolation due to their transformer and can operate without a power source. Active DIs need power (generally either phantom or batteries), can supply gain to the signal, and can have an extremely high input impedance, which is a must for certain sources such as piezos. Both types can handle the important tasks of balancing a signal and better matching (technically “bridging”) the impedance between the source and the mic preamp. When choosing, consider whether the specific application requires full isolation and/or gain, but you will be well served by the general rule of using active DIs on passive sources and passive DIs on active sources. This practice will help you keep you maximize SNR (signal-to-noise ratio) while reducing extra gain stages. So what’s all this ado about tubes? At least one manufacturer of tube DIs states that the tubes are used to achieve much higher input impedances. This works, but a tube is not the only way to achieve a high input Z. An FET (field effect transistor) can work just as well – for example, the classic Countryman Type 85 achieves a 10 Megaohm input Z using an FET input stage, so the tube isn’t the only way to skin this cat. However, I’d wager that tube DIs are usually chosen for artistic purposes. A DI is often used in place of an instrument amplifier, and since the amp itself contributes to the sound of the instrument, a plain ol’ DI’d bass or guitar can sound a bit odd. At the end of the day, some musicians opt for a tube DI simply because they like the way it sounds. As an engineer, I discuss this with artists before making any changes to their carefully sculpted tone once their signal is in my custody. But because in this case you’re the one playing the guitar, my advice is to head to your local music shop and arrange for a test drive to see if the tube sound is a good fit for the tone you’re looking to achieve. If I were mixing you, as long as your acoustic’s active pickup is putting out a healthy level, I’d start with a well-made passive DI. Read all of the “Ask Jonah” articles on PSW here. The two 1/4-inch jacks on a DI are generally wired in parallel – literally, they’re wired together – so plugging two different outputs into the two jacks is electronically equivalent to plugging those two devices straight into each other. This may work just fine, and it often does, which might be why you’ve never noticed an issue, but it can also cause bad things: overloading the output op-amps can cause nasty distortion or in some cases cause the device to simply shut off. These outcomes are less common with modern, competently designed devices, but I have still seen them occur and see no reason to take a gamble. If you need to combine inputs, use a passive summing box, which is a great thing to carry in your toolkit. The rule for Y cables is easy: splitting an output to multiple inputs is fine, but trying to combine multiple outputs into a single input is a no-go. For more on why, see the seminal “Rane Note 109: Why Not Wye?” on ProSoundWeb. The Radial JDI passive DI (and some other products by Radial) has a "merge" function where you can sum the 2 1/4" inputs via a resistor network internally so as to not "short out" the connections. My favorite is the BNC T adaptor! Not sure why that connector was made:) On iPods you can actually get them to cut out if you crank them up and short left to right without two resistors to simulate a set of ear buds. Just buck up and use a stereo DI. Most have a "mono" function which, as Andrew suggested, merges the signal from both channels. Later when you have enough inputs and need to run it in stereo, you will have that option available.